WE ARE THE REMIX is a film and video exhibition that explores the shaping of identities through moving image and music. Set in an immersive and colorful architectural design the exhibition will feature wondrous and thought-provoking audiovisual works by eight international and emerging artists. Visitors are invited to hang out and relax while watching the films. From 10 June – 20 August 2017 Röda Sten Konsthall is pleased to be presenting WE ARE THE REMIX; an international film and video exhibition, that explores and celebrates the diversity of global, cultural identities manifested through the compelling interplays between moving image and music. WE ARE THE REMIX features eight audiovisual works created by some of the most distinguished artists and filmmakers of today. Drawing on various genres such as music video, documentary, performance and animation the exhibition remixes human histories, imagined futures and dream worlds from across the globe. From denim clad youngsters rapping in the streets of Bangkok, to Jamaican impromptu reggae beats dance competitions, shamanistic rituals of Brazilian spiritualism and a hypnotizing electronic music festival event, WE ARE THE REMIX takes the audience on a raging, soulful and daunting journey. By mixing stories of political reality and futuristic fantasy, commercial pop culture and spiritual longing, the works come together in all their differences to celebrate the power of sound and music in the shaping and manifestation of cultural identity. For WE ARE THE REMIX the artist and design duo MUSEEA, consisting of Sofia Hedman (SE) and Serge Martynov (UK) have radically transformed the cavernous second floor ‘Cathedral’ space of Röda Sten Konsthall. 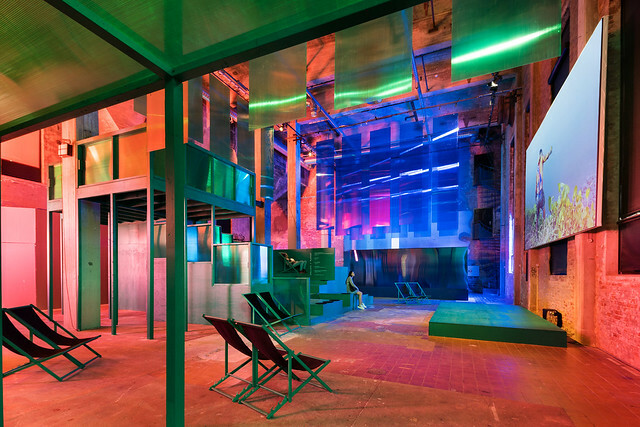 Bursting with color and saturated with music, the space unfolds a welcoming architectural environment. A large screen in the middle of the space serves as the main stage of the exhibition, screening a selection of videos in a repeating loop. Other works are placed in separate pavilions and on the third floor. Visitors are invited to lounge, relax and take a refreshment from the kiosk, while diving into the videos. The participating artists in WE ARE THE REMIX are: Halil Altindere (TR), Korakrit Arunanondchai (TH), Jeremy Deller & Cecilia Bengolea (UK/AR), Carsten Höller & Måns Månsson (DE/SE), Vincent Moon & Priscilla Telmon (FR), Nastivicious (AG/ES), Rachel Maclean (UK), Anne de Vries (NL). Creative workshops for kids from years old. Free admission! 7.30pm Híbridos. The Spirits of Brazil - an exclusive live-cinema performance by Vincent Moon and Priscilla Telmon. Expect shamanic techniques, improvised electronics and cinematic rituals of unique Brazilian transcendence. The performance will last approx. 45 min. 3 pm Vincent Moon and Priscilla Telmon performs a new and improvised iteration of Híbridos. The Spirits of Brazil in collaboration with musician Lisa Nordström and filmmaker Pether Lindgren. A rare and one-of-a-kind encounter between two sonic worlds. The performance is followed by a short talk and Q&A session with the artists.